Samsung no doubt brought something refreshing and new with its introduction of its S6 line earlier this year. 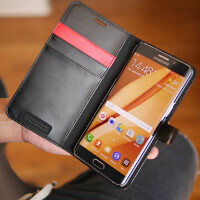 In complementing its flagship, Sammy also managed to turn heads with the addition of the S6 edge, and now that it’s been praised with acclaim, it was logical to for them to take it to a larger scale. Enter the Samsung Galaxy S6 edge+, a stylish phablet that continues with the same slick aesthetics of its sibling. Being a ginormous thing comprised out of glass and metal, it surely makes for a somewhat fragile package. Case maker Spigen has you covered, seeing that they have a portfolio that’s ready to complement your style. Naturally, the handset’s unique dual-curved display poses some challenges when it comes to designing a case that won’t impede its functionality. There’s no need to fret or worry, mainly because these cases have been thoughtfully and meticulously planned out to accommodate this intriguing design – and at the same time, many of them offer extended functionality. Unlike the actual handset, however, Spigen’s line of cases aren’t attached with crazy prices. Instead, if you happen to pick any of them up through its Amazon portal, you’ll be pleasantly surprised that they can be picked up on the cheap. In fact, the most you’ll end up paying is $20, which isn’t bad considering cases in general at regular brick and mortar stores can easily fetch for more than $25. Buy glass and metal built phone for looks, cover with plastic or rubber case. Double profit. Why would I buy a FAUX LEATHER phone case? It also won't charge my phone using the wireless charge without taking the case off when charging wirelessly. Samsung makes nice cases for their Edge+ and the case never has to come off. I got mine at Best Buy and they price matched. $60 -> $40. I can also see the time through the case.